Northwest Indian College has just finished constructing its Children’s Interactive Sensory Garden. The garden supports children’s education in the areas of Science, Technology, Engineering, and Mathematics (STEM). 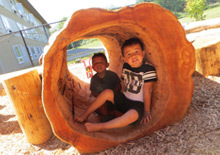 It has been thoughtfully designed to allow young children to observe, explore, and interact with a small ecosystem featuring plants that are indigenous to the area, hold traditional significance, and/or provide textural or botanical interest. On Wednesday, August 2nd Northwest Indian College’s Early Childhood Education degree program and Restorative Teachings Initiative hosted 20 visitors from Southwest University in Chongqing, China. The group included ECE faculty and teacher candidates from Southwest University, and practicing teachers from their partnering ECE programs. 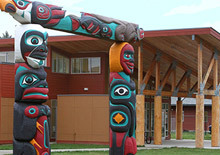 Their day with Northwest Indian College focused on the land, water, and place based teaching with young children and families. During the summer of 2016 the Northwest Indian College Early Learning Center (ELC) Director made the difficult decision to remove the large natural log-lined sandbox from the main play area. 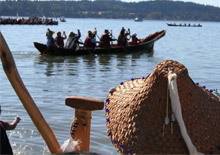 This structure was built by volunteers in 2009 and reflected the tidal shores that surround the Lummi Reservation. The sandbox was filled with natural sand similar to what you might find on the local beaches, and surrounded by large smooth sections of split logs that brought to mind the weatherworn driftwood the children on the Salish Sea grow up climbing on. On August 4th, members of the Restorative Teachings Early Childhood Education Initiative Coordinating Team visited Northwest Indian College’s Swinomish Extended Campus Site, in order to research and learn more about their widely acclaimed and highly renowned Native plants garden. On May 20, 2016, Northwest Indian College’s (NWIC) Restorative Teachings Initiative Coordinating Team held a family engagement event for the families of children enrolled at NWIC’s Early Learning Center (ELC). The purpose of this event was to introduce families to our Restorative Teachings Early Childhood Education Initiative-, share about the positive changes that will affect the ELC and NWIC, and to get a deeper understanding of the families’ conception of child health, nutrition, and wellness. We also wanted to remind families how invaluable their input and thoughts are in regards to this grant/project. When I was asked to participate in the Restorative Teaching Early Childhood Education Initiative Coordinating Team for Northwest Indian College (NWIC), I jumped at the opportunity. I knew this would be an incredible opportunity for me both personally and professionally. I would get to be a part of a project that would do great things for the very community I come from, while at the same time, furthering my experience in the academic world. n February 6, 2016, Bellingham Technical College hosted its annual “Focus on Children” Early Childhood Education conference. This professional development event draws early childhood educators from a five-county area to think collectively and reflect collaboratively about critical issues in early childhood education.